Internet pundits have made many historical comparisons generated by the passing of Steve Jobs, the most common comparisons being to Henry Ford and Thomas Edison. People remember Henry Ford for improving the manufacturing process. People remember Edison for his inventions. People remember Steve Jobs for improving the design of existing products and expert marketing of those products. To me, these sound like three different people. I think the most accurate Steve Jobs comparison is that he was the next A.P. Carter – one of the founding fathers of country music. No one remembers AP for musical ability or vocal talent. People do remember his band, the Carter Family and their iconic music, both for style and material. AP spent years scouring the countryside, learning and refining songs that would otherwise have been lost to history. He also arranged the songs to better fit with the recording technology of his day (the 1930s). He even popularized many songs to such a high degree that people often credit him with writing songs that are either century old traditional songs or obscure songs by known composers. For more information check out Mark Zwonitzer’s excellent biography “Will You Miss Me When I’m Gone? 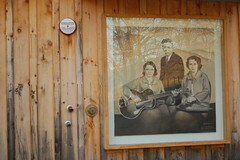 The Carter Family and their legacy in American Music“.